Mowing isn’t the most enjoyable of yard care jobs. It’s noisy, dust and grass clippings get thrown around, and you can exhaust yourself just pushing a heavy mower. But in the end, the reward of a beautiful and usable yard is totally worth it. Still, that’s no reason to work harder than you have to. The mowers we will review in this article take the effort out of pushing so that all you have to do is hold on and steer. Stick with us to discover the best self propelled lawn mower for your unique needs. Self propelled lawn mowers work via a drive wheel that propels the device forward. Whether that drive wheel powers the front tires, rear tires, or all four tires, the result is that you don’t have to put much muscle power into pushing the thing. Mostly, you just have to hold on and steer. That makes a huge difference on land that has hills, even little ones. Depending on various factors, users still experience fatigue and muscle soreness from navigating even the most lightweight push mower available – and these have limitations in terms of cutting results. You don’t need to worry about a self propelled mower taking off from you, because the forward motion is only engaged when the user holds back a special handlebar. When you let go, the mower will stop moving. However, if mobility presents a challenge for you, look for a mower with variable speed, so that you can set the pace to a speed that’s comfortable for you. The best self propelled lawn mower for you depends a lot on the terrain of your yard. Front wheel drive mowers excel on mostly flat ground, but the best lawn mower for steep banks usually has rear wheel drive. Another benefit of rear wheel drive is that the forward motion is not halted when you tip the mower back to make a turn. All wheel drive lawn mowers offer superior performance on all types of terrain, but they are a bit more expensive. For the purposes of this article, we have omitted front wheel drive mowers simply because they are less flexible in terms of the terrain they handle. If you have a mostly flat yard, there is no reason to avoid a front wheel drive lawn mower. 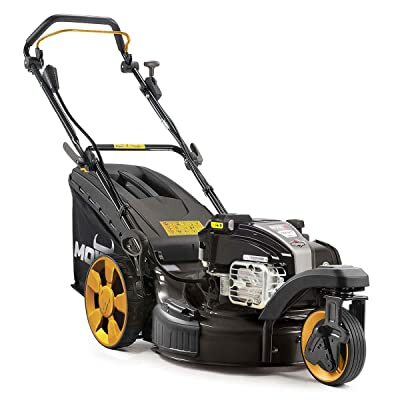 Cutting the grass cleanly is a lawn mower’s most important job, but nowadays you can expect a certain number of extra features designed to improve ease of use and user comfort. Following are some potential extras that you could find on the mower of your choice. Padded handles – The vibration taken in your hands and wrists as you mow is uncomfortable and can eventually lead to nerve damage. A padded handle reduces this effect. Adjustable handle height – Very few people are actually of “average” height, meaning that those taller or shorter than the average may experience discomfort from having to bend or stretch in order to operate their mower. An adjustable handle solves this problem. Foldable handle – What about when you are not using your mower? If you’re short on storage space, look for a mower with a handle that folds down. This can save a ton of room in your garage or shed. Multi-position collection bag – Choices are good. You may find that for various reasons, you sometimes prefer to have the collection bag mounted on the back of your mower, while side mount works better at other times. Cup holder – It gets really hot out there during the summer, so having a cold drink of water at hand can keep you from getting dehydrated or experiencing heat stroke. Left-handed trigger switch – If you are a lefty, you’ll appreciate the ability to more comfortably engage multiple bars or switches on your lawn mower. Variable speed – Sometimes the fastest self propelled lawn mower will keep you at a jog. With variable speed, you can slow it down to a more comfortable pace. 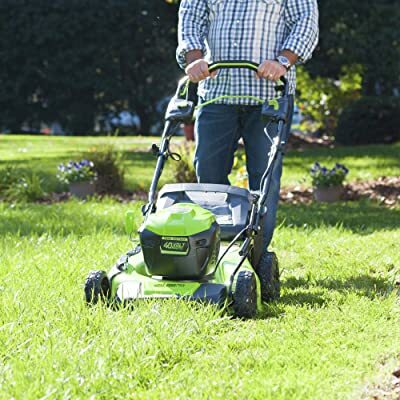 It’s time to shop for your new mower! Now let’s dig deeper into the features with in-depth lawn mower reviews. Sometimes the hardest part about mowing the lawn is getting your lawn mower started! Husqvarna has addressed this problem with their 2-pull start guarantee. The 163cc Briggs & Stratton engine also never requires an oil change, so that’s one less hassle on your list. This Husqvarna is easily maneuverable and relatively light at 80 pounds. The 21”cutting deck is standard, but the premier cut blades on this machine offer professionally manicured results. With all-wheel drive propulsion and 11” high rear ball-bearing wheels, you might not even break a sweat. If you happen to be left-handed, you will especially appreciate the Dual Trigger Drive activation, which lets you toggle the speed setting with either hand. One potential negative is that the handle lacks padding, so you will experience vibrations as you mow. The handle is also not adjustable to different heights, which has the potential to force some users to stoop. Some good news is that the mower has a handy wash-out port. It is a mulching mower with a rear mounted collection bag. The deck is constructed with sturdy 15-gauge steel. The Husqvarna LC221AH self propelled lawn mower comes with a three year bumper-to-bumper warranty. 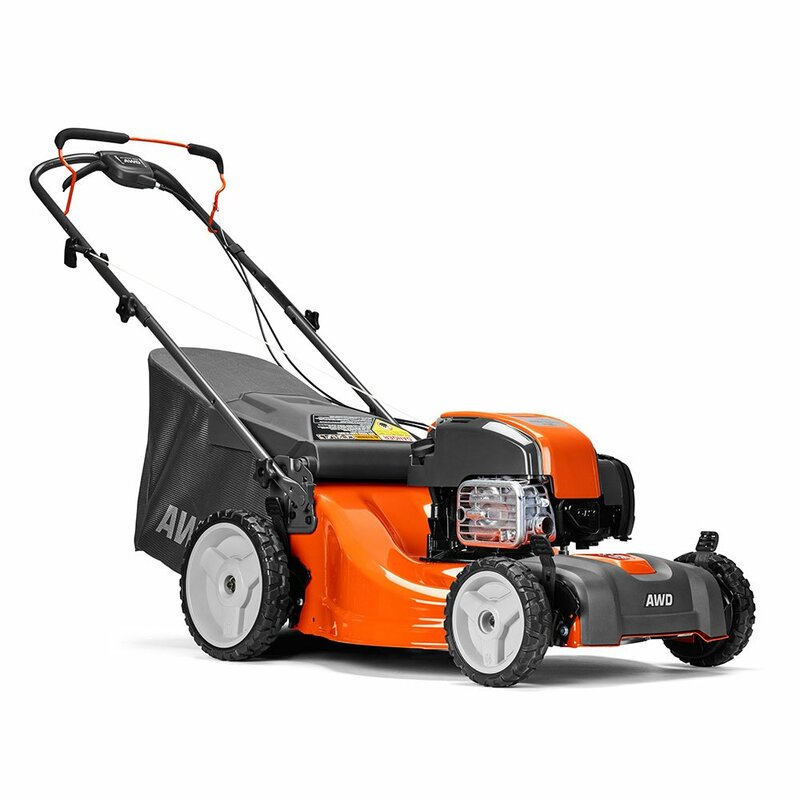 Gas powered mowers are the most common and they do offer a lot in the way of power. But with their excessive noise and environmental impacts, you may want to consider a battery powered mower instead. This Greenworks model, for example, runs nearly silently and with no noxious emissions. It has a 40V battery and starts with the touch of a button. You still get an ample 21” cutting deck, made out of durable steel. The mower features rear wheel drive and a 3-in-1 option that allows you to mulch cuttings, bag them to the rear, or discharge them from the side. For all that it is still a nice small lawn mower at just 70 pounds. Unlike other mowers, this Greenworks has the added benefit of a USB port in the battery so that you can charge your electronic devices while you mow! We’re not sure anyone really needs to do that, but it’s nice to know you could in a pinch. Most people will probably prefer to save the battery life for mowing. But speaking of battery life, another helpful feature is a secondary port for storing an extra battery while you mow. If you run out of juice and need to change batteries mid-job, the replacement is right at hand, not lost in a junk drawer in the garage. The battery life is reported by the manufacturer as about 70 minutes in ideal conditions, but users suggest somewhere around 45 minutes of heavy duty work per charge. If you like the Greenworks brand, you may want to purchase all of your lawn care tools from them. You’ll find a whole range of 40V tools, and they all use the same battery as the mower. That has a lot of potential to save money and hassle. The mower comes with a 4 year warranty on the machine itself, but just 2 years on the batteries. 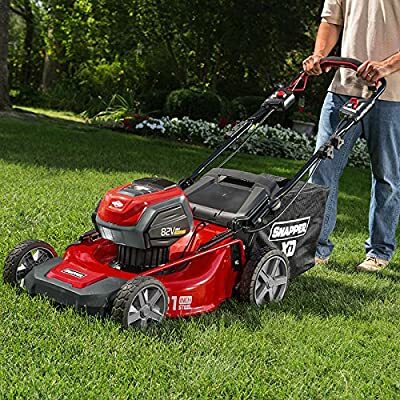 This Lawn-Boy mower is a self propelled gas powered machine, but it also has an electric start feature that fires it up with the turn of a key. The 149cc Kohler OHV engine is CARB compliant, so the emissions are low enough to meet all national clean air standards. The engine oil will never need changing, but it’s important to check the level and add more when necessary. The deck is made out of strong steel, so you can feel confident that the Lawn-Boy is a tough, long lasting option. The rear wheel drive will help you navigate through yards with varying terrain. Set your preferred cutting height via two levers situated along one side of the handle. Like other mowers on our list, you will enjoy a 21” cutting swath with this tool. When it comes to the grass clippings, it has a 3-in-1 discharge ability. Choose side discharge, rear bagging, or mulching depending on your preference each time you mow. Users report that the collection bag is large and sturdy so that it doesn’t require frequent stops to empty. Variable speed settings are available, engaged by holding the handlebar at different positions. Overall, the Lawn-Boy can be counted on to start easily and provide a superior cut every time. The manufacturer backs this mower with a 2 year warranty, but extends that on the starter, which they will fix for free if you have any problems in the first 3 years. If you are looking for something a little unusual, this Mowox mower could be perfect for you. It is a hybrid model, gas powered but with a battery-assisted electric start. When the battery is fully charged, you get about 75 starts before you’ll need to recharge. But if you run out of juice in the middle of a job, a short 10 minute session on the charger will provide about 20 additional starts. There is plenty of power to be had from the 163cc Briggs & Stratton InStart Series engine. As with other new mowers, you never need to change the oil entirely, but just top it up as needed. Unlike other mowers, Mowox does not include an initial supply of oil in the box. But the portable lithium-ion battery and its charger do come with your purchase. It’s the handling that we think you are really going to appreciate. This Mowox has rear wheel drive but just one wheel in the front, endowing this machine with a zero turn radius. The front wheel can turn 360 degrees, but it can also be locked into place when you need super straight cuts. For regular use, simply swing the mower around on its front wheel and head the other way. There is no need to adjust the mower further in order to match up with your previous cutting track. Unfortunately, this mower is not CARB compliant for emissions, so it is not available for sale in California. Some reviewers complained that the assembly directions are limited and almost incomprehensible, so this may be a mower that’s better for people who can intuitively understand how to correctly route the cables and attach the handle and front wheel. One of the hassles of battery-powered devices is that you have to be careful not to overcharge them. Leaving a battery on the charger for days or weeks between uses can actually reduce the storage capacity of that battery. The Snapper XD addresses this problem by providing a smart charger and two batteries with your purchase of the mower. That means that the charger shuts off automatically when the battery is charged, and it saves you having to remember to go back and unplug it yourself. But let’s move on to the mowing part – after all, a smart charger doesn’t mean much if the mower can’t deliver a beautifully manicured lawn. However, that’s not the case with the Snapper XD, which uses a powerful 82V battery that goes at full tilt for about 45 minutes per charge. With two batteries available, that should provide enough time to get the job done. The mower preserves and extends battery life with load sensing technology, which adjusts the power flow to the blades when conditions change. More power is necessary in dense vegetation, which does mean a higher power drain, but it is downright impressive that a battery-powered mower can handle thick, dense grass at all. Get mowing in a snap with a push button start and achieve the perfect cut with 7 possible cutting heights controlled with one lever. This is a rear wheel drive mower that also has a variable speed option so that you can work at a speed comfortable to you. Like other mowers on our list, this one has a 21” steel cutting deck and allows you to side discharge, rear bag, or mulch the clippings. The handle is ergonomically padded for user comfort. And if storage space is an issue, you will love that this and other battery powered mowers can be stored in pretty much any position. Gas mowers need to be stored upright or the oil dumps into the engine. A generous 5 year warranty comes with your purchase of this mower. Obviously, mowing creates a lot of grass clippings that need to go somewhere. Several of the mowers on our list allow you to choose from three options for this – side discharge, mulching, or rear bagging. There are benefits to each choice, and it is especially nice to be able to change up your strategy depending on the day. Mulching shreds grass clippings into a fine material that can both fertilize the grass and help the lawn retain moisture. Those are two things that can otherwise cost you additional time and money to accomplish. Mulching as you mow is a great multi-tasking move. Simple side discharge also leaves the cuttings spread on the lawn, but because they are bigger pieces, they won’t break down as fast as mulched clippings. You may want to choose this if ground cover is your chief concern. It can also be helpful if you have scalped patches in your lawn, or if the weather is going to be so hot as to fry the grass. But for the cleanest looking cut possible, not to mention the ability to play in the yard without getting covered in loose grass, you will want to bag the clippings. Bagging is also ideal if your lawn contains a lot of weeds, as both mulching and side discharge will spread those seeds around really quickly. Like any tool, a self propelled mower needs a certain amount of maintenance to keep it running optimally over many years. To protect your investment, remember to complete the following tasks. Read your owner’s manual – you’ll be surprised by what sorts of activities will void your warranty. Honestly, if you’re not going to use a riding lawn mower, a self propelled model is the way to go! You still get some exercise pushing the thing, but it won’t exhaust you to the point that you can’t then enjoy the yard. 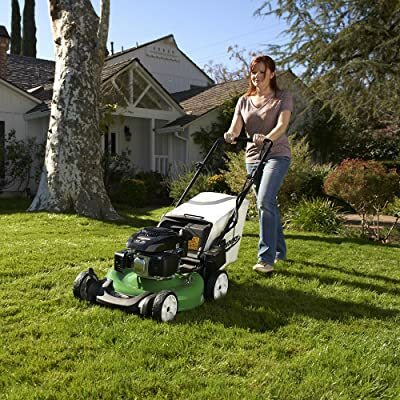 Self propelled mowers may be either gas or battery powered (a few even have electrical cords), so you can choose exactly what works best for your particular lawn. Larger spaces generally do better with gas mowers, because they can go longer on one tank than a battery mower can on one charge. But the downside is their loud operating volume and exhaust emissions. Whatever you choose, we hope we have given you all the information you need to hone in on your personal best self propelled lawn mower. The right one can make a bothersome chore a pleasure…well, almost.